This bombus terrestris was spotted on a Coastal Banksia in the garden last Friday. I think it’s a Queen. But I’m not an expert on the identification of the bumblebee, so I can only go by what I found snooping around online. When it comes to the buff-tailed bumblebee, queens are bigger than males and have a golden (buff) coloured tail, whereas males have a white colouring to their bottoms. This bee is HUGE and appears to have a golden coloured tail and that’s why I think it’s a queen. I stood there mesmerised by its size and the ferocity in which it devoured the nectar. I was equally astounded it could fly at all (considering its ratio of wing size to body) and had a moment of panic when it spotted my purple jumper and came to investigate. The Australian Government, Department of the Environment classifies them as an invasive bee, and you can read more about bombus terrestris and other introduced species here. Previous Post Previous post:What Shoes? Next Post He Drives Me Nuts! Had no idea that bees could be that large. I enjoy learning new things every day. Glad I can help you meet your daily assignment and helped you learn something new today. This is funny, I just watched a video on these bee’s! Oh the universe works in such mysterious ways Roni. Thanks Clare – so this is the place to leave the link to my photo of the week, I linked it to something on the blog – but obviously, I hadn’t come here – so this is the link to and update with pictures galore, or my now 10 day old chicks. Thank you for joining in. Your chicks look so cute and absolutely adorable. Amazing photo – but what is the plant it is feeding on – you have readers in other countries like me in the UK – so please enlighten me – smile! 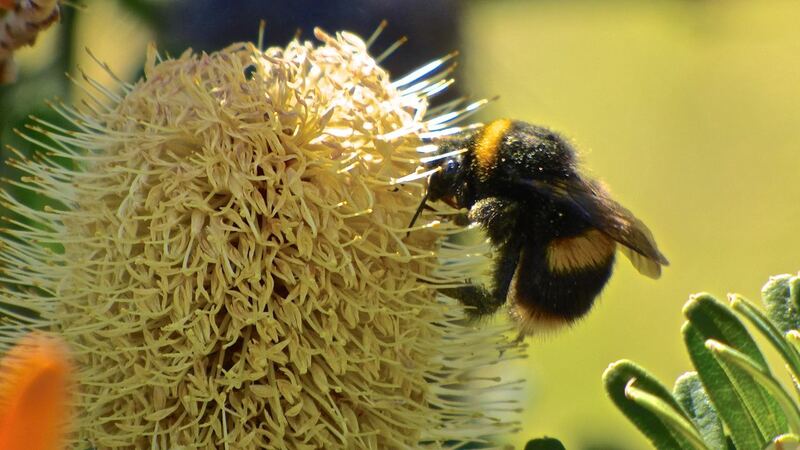 Sorry – it’s a Banksia. It’s an Australian native wildflower. Did you follow the link? Thanks for putting up the link – I have had a look and it seems to be a common plant, which is probably why you didn’t think it needed explanation – but I’ve never heard of it before – the structure is quite amazing! I’ll take some more photos to share. Only thing is, the weather is getting much colder now and the blooms have just about come to an end with Winter closing in.